Eddo Stern, Best Flame War Ever, 2007, still from an animated video, 14 minutes 37 seconds. The first solo exhibition in the UK by the Tel Aviv–born artist Eddo Stern presents a visually dazzling array of alternative universes. References to Balinese shadow puppets and fantasy fiction (think Aslan, the golden lion from C. S. Lewis’s “Chronicles of Narnia” [1950–56], as well as indigo multiheaded dragons) meet and mingle with online avatars in Stern’s psychedelic sculptures and videos. The mechanical puppet Lotusman, 2007, is the first to greet viewers. This macho man’s visage floats on a bed of lotus-pink muscular limbs that flap like wings above green leaves. Casting giant, intensely hued moving shadows on a wall, this work evokes a mythical beast sailing menacingly through the air and re-creates the eerie glamour of bygone magic-lantern displays. Yet Stern is nothing if not topical. He’s famous for populating his work with references to gaming, and his video animations are the most ostensibly conceptual works on view. 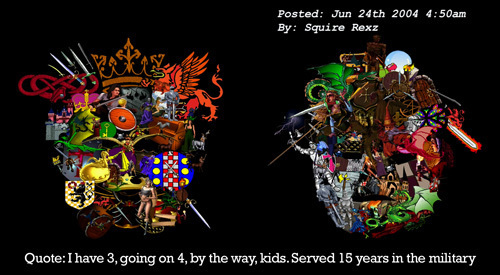 Best Flame War Ever, 2007, is a recorded conversation between the King of Bards and Squire Rex, two online personae involved in the computer role-playing game EverQuest. Their discussion of the game rapidly morphs into an excuse to trade insults, revealing the masculinity-obsessed aggression lurking behind even such seemingly innocent flights of fancy. Since Stern highlights the connection between fantasy (whether in the guise of mythology, sci-fi, or Internet subcultures) and humanity’s violent impulses, it is tempting to read political commentary into his sinisterly seductive art. The animation-based projection Portal, Wormhole, Flythrough (Fake Version), 2009, is deliberately disorientating. A massive screen is saturated with a blazing, throbbing, and patterned kaleidoscope of color: red, blue, hot pink, and checkered black-and-white hues appear and disappear, simulating the sensation of toppling headlong into an endless tunnel. Is this work a comment on the sliding boundaries between fact and fiction? Or a metaphor for Israel’s perennial border disputes?